The CKC invites you to share your treasures in our new Crowdsourced Collection as part of the “first 500” treasures – a test collection we will use to refine the design, features, and functionality of our online interface before expanding this collection for additional contributions. Please consider adding your treasure to CKC’s “first 500” treasures! I need instructions on filling out the online contribution form for the Crowdsourced Collection. Images produced with digital camera to highest quality setting (e.g. superfine, best) are usually acceptable. 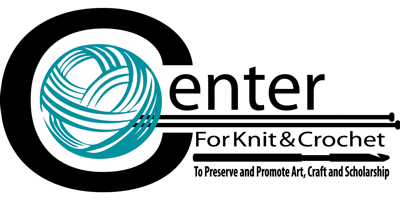 Users who want to contribute video or audio files please contact info@centerforknitandcrochet.org for more information. Provide a brief description (5-10 words) that encapsulates the most important elements of your object. List the creator's name as Last name, First name. If you do not know the creator's name, leave this field blank. Enter the four-digit year that the object was made. If you do not know the date of the object, leave this field blank. •	Why it was made (personal story aspect: who it was made for; historical aspects; elaborate on qualities that make it a “treasure”). A statement of any changes in ownership and custody of the resource since its creation that are significant for its authenticity, integrity, and interpretation. The statement may include a description of any changes successive custodians made to the resource.